AJ Tobacco by Titanic eLiquid is a beautifully crafted, slightly sweet tobacco e-liquid. With a stronger throat hit than our other blends, we find this not-so-mild and unique offering is better suited to experienced tobacco e-juice vapers. A real tobacco treat. Why 'AJ Tobacco'? Read the story of AJ below. What strength is suitable for you? Story of AJ Tobacco: It wasn’t until they breathed in the aroma of the lush green tobacco platation did they realised exactly where they were. It was the summer of 2016 and founders of Titanic eLiquid, Andrew Johnson and Graham Walter, had been on a road trip across the USA. After a 8 hour journey from North Carolina in their rented Mustang it was time for a well deserved pit stop. Pulling over and stepping out of the Selby GT500, the two friends were struck by the vast plantation that seemed to expand into infinity. They had arrived in Tennesee. And it was here where the AJ and GW tobacco e-liquids were born. Fast forward two years, and after months of scouring the land for the finest tobacco flavourings, experimenting in the lab, consulting with the finest flavour experts, after much blood, sweat and toil they imported it ready-made and re-labelled them AJ and GW tobacco. 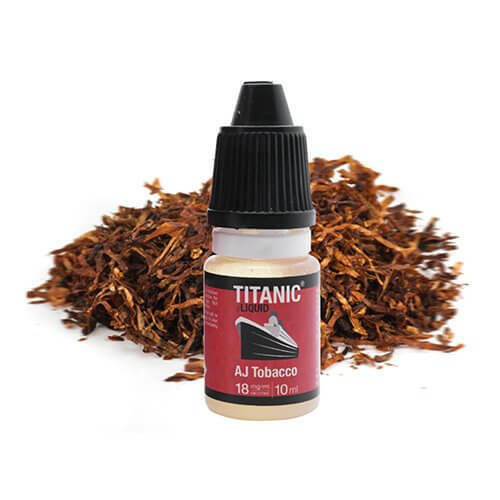 About tobacco e-liquids: We have found that smokers that try vaping for the first time tend to prefer tobacco flavoured juices like AJ Tobacco over fruity flavours. This is mainly due to the similarities in taste between real tobacco and the tobacco e-liquids. Some ex-smokers find that the non-tobacco e-liquids a bit gimmicky. 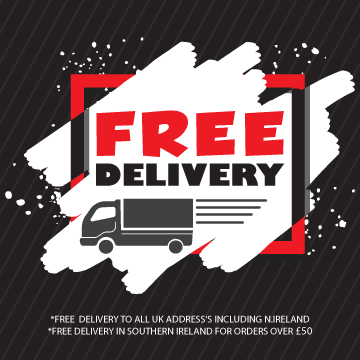 Our range covers most tastes and preferences - if you are not sure which is right for you please feel free to contact us. 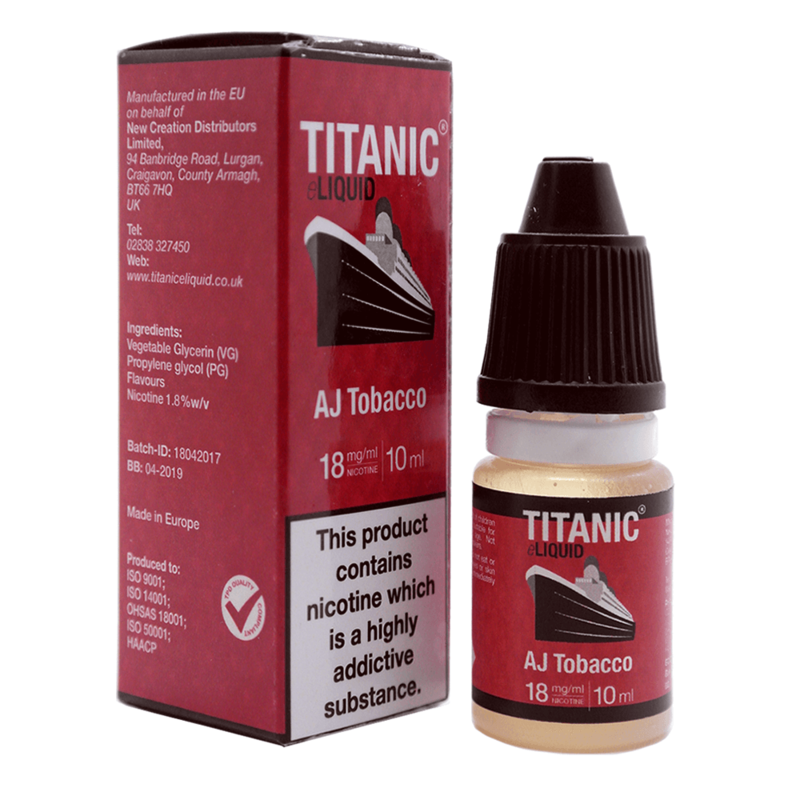 Our AJ Tobacco eLiquids are made in the EU with high quality ingredients. Flavourings are of food grade quality and we only use pharmaceutical grade PG/VG and nicotine. AJ Tobacco is suitable for all types of devices and vaping behaviours. About Child-resistant packaging: Our packaging is child resistant but not child proof! AJ tobacco e-liquid is ready to vape. Does AJ tobacco taste like the real thing? We work hard to source the best products for our customers. And while we believe AJ tobacco e-liquid is an excellent substitute to real tobacco, it is important to know that it will not taste the same.